Safety / Security Films – National Window Tinting, Inc.
Safety and Security film is tough, durable, tear and penetration-resistant shield that bonds to the inside of the window for protection. The film helps hold the glass together to dramatically reduce the chance of glass shards from falling or flying out - even under direct forces from winds or impacts from flying objects or heavy devices used for breaking and entering. Bomb Blast Mitigation - Flying glass shards are one of the most common causes of blast-related injuries. Security Window Films have been tested to government-referenced standards, and meet or exceed requirements on numerous glazing types. Security against crime - Safety and Security Film is to deter smash-and-grab crimes. Since time and stealth are vital in this type of robbery, thieves usually give up quickly. Safety against injury - This film reduces the chance of serious injury caused by flying debris from storms or people falling or running into glass doors or windows. 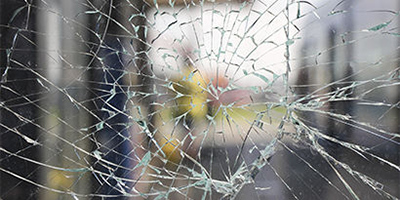 Protection against violent weather - Even if windows or glass doors are smashed, the film offers increased protection against falling shards of glass, debris, wind and water. National Window Tinting has received specific training on the proper installation methods of Security Films and the proper methods for securing these types of films using the various anchoring methods. If you are concerned about these types of incidents, consider installing these types of films as a defense against potential explosions. © 2017 National Window Tinting, Inc.